Logistics website design specialist Design Inc designed and developed a unique solution for niche couriers Carry Gently. 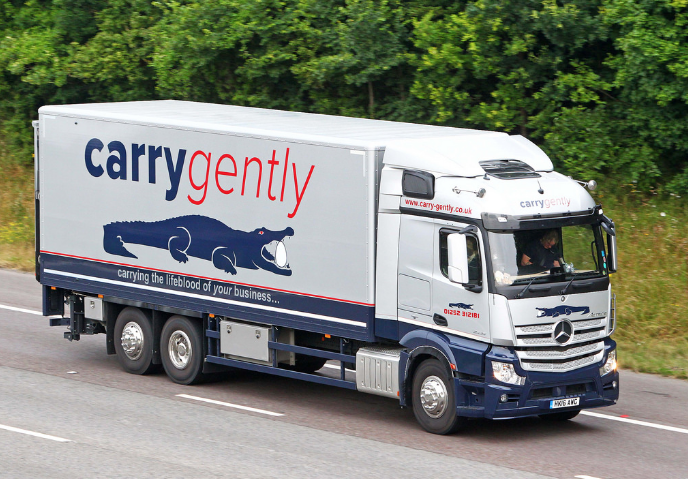 The leading specialist transport services logistics provider with the fabulous asset of the ‘does what it says on the tin’ name ‘Carry Gently’ came to us. The time had come, they felt, for the rest of their brand to catch-up with the very strong name. The rebranding brief included a repositioning and modernisation of the logotype, descriptor and strap line, the introduction of homepage slider campaign featuring highly evolved specialist animals as a metaphor for taking extreme care, flexibility and teamwork in the natural environment. A new colour palette, font family, tone of voice, image hierarchy, illustrations and icon graphics assets were all part of the scope. These elements were then deployed in the design and build of a fully responsive website based on WordPress with full CMS. Search engine optimisation for the site as well as additional elements like matching efooters and social media skins completed the mix. 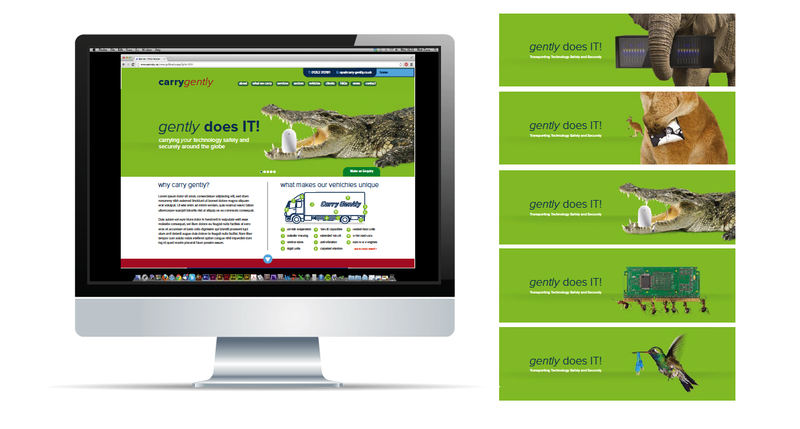 The project was a year in the making and finally went live to a very positive client and stakeholder reaction. The company has truly reinvented itself and effectively leap-frogged the competition in terms of their standout, branding and digital presence. The vehicle liveries were also changed to match and take this new logistics brand truly out on the road. The UX design features a mixture of tablet/phone led design. Research showed that many Carry Gently users were working on desktop computers. 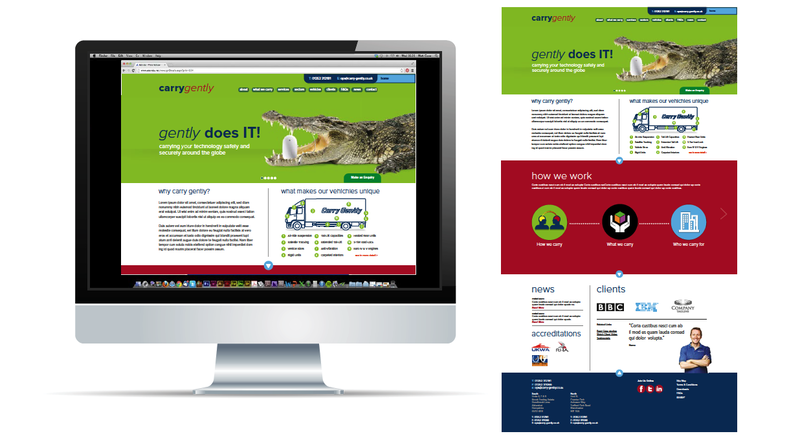 The home page scrolls down and left and right to provide an overview of the whole Carry Gently service. There is also a clickable ‘desktop’ menu and hierarchical levels of service and sector information including a set of customer reference programme case studies. The plan being to provide the best of both worlds – mobile/table and desktop to the user within a single site – without the need to move between mobile site and main site. Click here to find out more about our logistics website design specialist approach. Please take a quick moment to consent to us contacting you. Please note that we will be unable to contact you unless you provide consent to at least one of the above. You are now subscribed to the great content that Design Inc have to offer!